Apple no longer reserves its latest chips for flagship devices. You get the same A12 Bionic processor and impressive Neural Engine found in the 2018 iPhone lineup with the new iPad Air and iPad mini. And that’s not all you get. The new Apple tablets might look familiar, with exactly the same designs as previously released models. But Apple’s newest slates are improved in almost every way. The 2019 iPad Air isn’t quite the entry-level iPad replacement we were expecting. It costs around $170 more than the 9.7-inch model. However, you get a lot more for your money — including a 70 percent boost in performance and twice the graphics capability of the 9.7-inch model. Plus, the new iPad Air design is based on the (now-discontinued) 10.5-inch iPad Pro. The device packs a stunning 10.5-inch Retina display with True Tone technology, with improved cameras perfect for FaceTime calls and augmented reality. With all these iPad models floating around, it’s easy to get confused. But the iPad Air differs from Apple’s iPad Pro current lineup in a few key ways. First, its six-core A12 Bionic is a step down from the eight-core A12X Bionic used in the 2018 iPad Pros. Plus, the new iPad Air utilizes a Touch ID fingerprint reader rather than Face ID’s facial recognition for authentication. And it still uses a Lightning connector rather than USB-C, just like the rest of the non-Pro lineup. The fifth-generation iPad mini delivers much of the same as the new iPad Air, but in a smaller package that’s the same design as the iPad mini 4. It’s powered by exactly the same A12 chip as the iPad Air. Its 7.9-inch Retina display with True Tone boasts wide color support. It’s 25 percent brighter than the previous iPad mini. And it delivers the highest pixel density of any iPad screen. 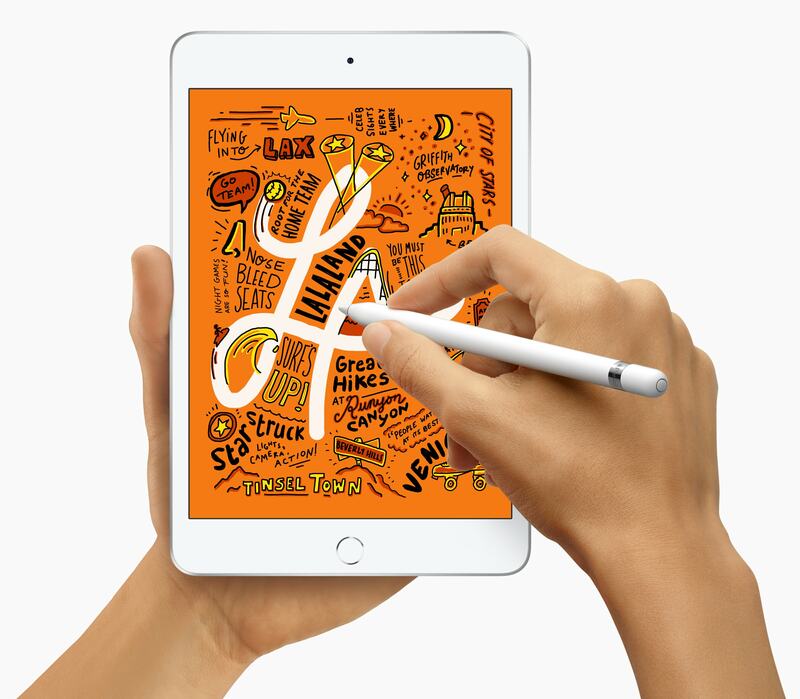 The new iPad mini also, for the first time, supports the Apple Pencil. It also delivers the same powerful multitasking features you would expect from larger iPads, including Split View, Slide Over, and Drag and Drop. iPad mini finally has Apple Pencil support. Apple’s newest iPads are available to order online today, and will be in stores next week. 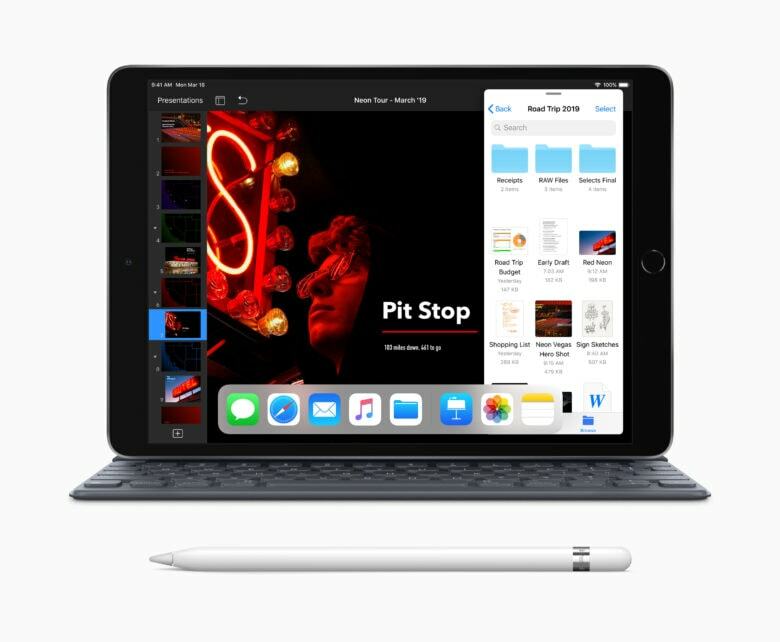 The new iPad mini starts at $399 for 64GB of storage and Wi-Fi connectivity. The same model with LTE runs $529. The new iPad Air starts at $499 with 64GB of storage and Wi-Fi. Adding LTE to that will cost you $629. The new iPad Air is compatible with the same Smart Keyboard sold for the 10.5-inch iPad Pro (now available in leather and a new papaya color). That’s available today, retailing for $159. Both devices work with the first-generation Apple Pencil, which lists for $99, as well as Logitech’s less-expensive stylus, the Crayon. Update: We originally published this story at 5:37 a.m. on March 18. We updated it to add details on features and to correct information about the chip inside the new iPads.